Touring Egypt 20: This is not the fish I sought or the shot I wanted on this day. I spent most of this dive trying to get a shot of the ubiquitous scalefin anthea*, a brightly-colored orange, yellow, pink, and sometimes purple small fish that is all over the Red Sea. I love the antheas — they are probably my favorite Red Sea reef fish. By this point I had been trying for several dives but been completely unsuccessful in getting a shot of the little pretties; they are just too shy and too fast. Yet another one got away. I looked up to check on my dive group and found that I had more unusual company. 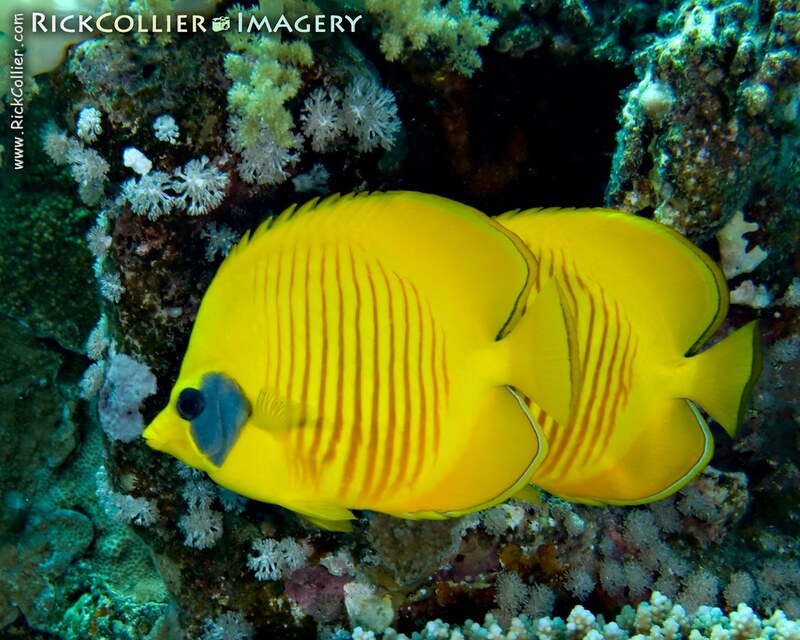 While I know that butterflyfish are also not uncommon, I had not yet seen any on this trip — until I looked up. There was a pair of masked butterflyfish following right along with me, in my shadow along the reef wall. I had no time to set up the shot: I focused and fired. The fish bolted. Even when they fled, these two swam as a pair. I never got a clear look at the second butterflyfish. *Look for a shot of a scalefin anthea in a future post. I failed on this dive, but did eventually get one. This entry was posted on Friday, September 18th, 2009 at 19:29 PM. It is filed under thePhotoTourist, Underwater and tagged with butterfly fish, butterflyfish, coral reef, destination, Egypt, fish, Gazlani, masked butterflyfish, Ras Gazlani, Ras Mohamed, Ras Muhammad, Ras Muhammad National Park, Red Sea, scuba, Underwater. You can follow any responses to this entry through the RSS 2.0 feed.